At the end of 2016 Digital StoryLab expanded our office to Berlin, when we held our first workshop in this lively city – so full of stories. It was a classic 3-day workshop with six participants, and it turned out highly successful. The weekend offered deep self-reflection, wonderful group dynamic, and concentrated hard work, which resulted in six beautiful stories and very happy and satisfied participants. See the great stories at our Vimeo channel. Now its time to repeat the success. We’ll have another 3-day workshop in the weekend March 24th-26th 2017, from Friday to Sunday. 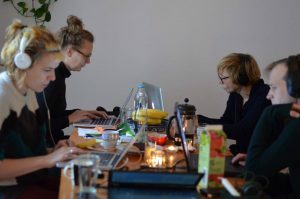 Write to our Berlin facilitator, Signe Sander, signe@digitalstorylab.com to sign up or with any questions regarding the workshop. Have a look at the preliminary schedule here.